ADAM BARTON can become a Pompey cult hero. Paul Cook believes Barton can make himself a fans’ favourite after shining in a makeshift defensive role. He’s brave - even if he makes me shut my eyes at times! 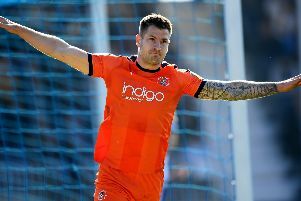 Barton has impressed as a centre-half against Luton and Ipswich. Calm play and bringing the ball out from the back have been features of the 25-year-old’s performances. Cook feels supporters love that approach, even if it gives him heart-stopping moments. He said: ‘Adam was outstanding at Ipswich and against Luton when we played him there. ‘Adam can become a cult hero. He can become a cult favourite with our supporters when he plays like that. ‘I like my centre-halves to step out. That’s what he does. ‘He’s brave when he does that – even if he makes me shut my eyes at times! Assistant manager, Lean Richardson echoed Cook’s praise for Barton. Richardson hasn’t been surprised to see the midfielder shine in the role at the back. He said: ‘He’s playing out of position, but you’d never guess if you were a neutral coming to the game. ‘He’s just a good footballer wherever he is on the pitch. ‘So far, we fit how Adam wants to play the game. ‘When you work with him on a daily basis you can see what Adam’s qualities are. ‘He takes things in his stride and isn’t overawed. Meanwhile, Pompey have been linked with a move for young Liverpool goalkeeper Ryan Fulton.